Mens Clothing There are 17 products. This classic country shirt is ideal for any man's wardrobe. Finished in a burgundy check. This fantastic Waterproof Camouflage Smock is packed full of features with plenty of pockets and a hidden face veil included. 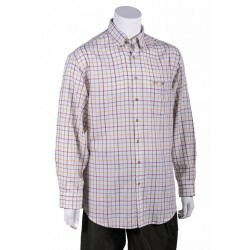 A fantastic long sleeved checked country shirt with placket front and single button through chest pocket. Another classic fit polo shirt that keeps coming back year after year. Perfect for any wardrobe at any time. The Filbert Polo Shirt is a classicly styled polo. It vibrant stripes will help you stand out and raise your wardrobe game. A vibrant polo from Joules, washed for extra softness, it'll feel perfect on you from the very first wear. The Joules Regal Polo Shirt is a classic polo inspired by Joules' own equestrian heritage. A smart t-shirt ideal for warmer weather. Crafted from the finest cotton it is a fantastic addition to your wardrobe. A classic fit shirt from Joules designed to be perfect for any man. Crafted from a new lightweight cotton, it's sleek and warm for the winter months.